Ive been having computer problems all morning so sorry this is a bit late..Im over computers not behaving thats for sure! Technology aye? Very frustrating. 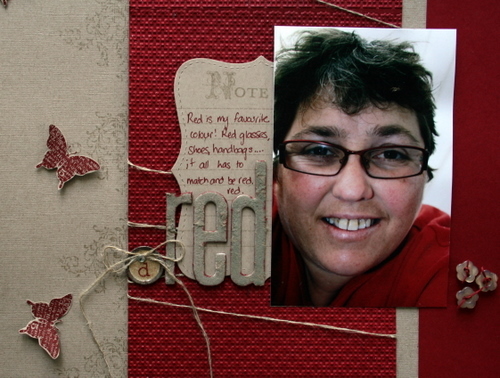 Anyway this month at Stampamemory we have a red challenge going on and we would love to see some red Layouts from you all. I did this one at stamp camp this past weekend and it came together really quickly but then I hummed and haaed over whether it needed more ..but I decided to leave it as is. Ive used Bliss Saleabration stamps and Notes and details (summer mini) for this layout along with the top note die, some buttons, hemp twine,lattice embosssing folder, silver foil smooch spritz, mini vintage tag, rhinestone and alphabet soup Chipboard which I distressed. Go and check out what the other Design team members have done..they are absolutely gorgeous! You can check them out here.. Tomorrow Ill be back with another LO that I taught at stamp camp over the weekend. Delys – this is perfect just as it is. Fantastic page. I love your chipboard letters! I LOVE your layout Delys! I really need to get that Bliss stamp set, it looks fab on your page. Fantastic layout. I’m a red girl too – I wore red shoes under my wedding dress! An awesome layout Delys. Great to meet you at the weekend and for the fantastic LO you had us make. I am still buzzing about the page I made. Thanks again. 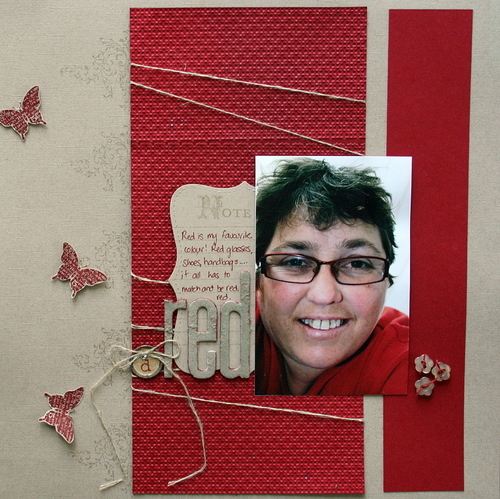 Beautiful layout and photo Delys – that SAB Bliss butterfly is the best isn’t it. LOVE this, Delys; isn’t it funny how many of us are “red” girls?! I wanna come to one of your stamp camps!!! Great page as always Delys! Look forward to more time on DT with you…funny how I seem to chase you around the different places LOL Wonder where we will be together next? !